A well crafted collaboration platform can increase productivity of your company significantly. Team cannot collaborate if they cannot communicate efficiently leaving aside the location and time-zone factors. Everyday new collaboration tools are coming up in the market and the existing ones are constantly improving and adding new features to their products. Zimbra is an up to date collaboration tool being used by experts since 10+ years in the industry. 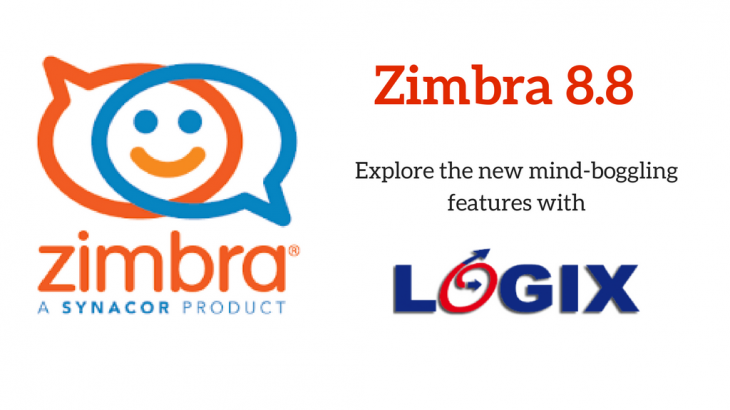 The latest release Zimbra 8.8 consists of nice new features including the New Realtime backup, New HSM and volume management options, reintroduction of Chat, Zimbra Drive for file sharing, a high-performance IMAP engine, and a ton of bug fixes. Having a very good realtime backup is of utmost importance, in order to restore the original data in case if lost or stolen. The company operations can run smoothly with good restore options. Zimbra 8.8 provides New Realtime Backup with 6 restore options. No data loss during backup, and new de-duplication technology results in up to 50% saving on storage space for backups. In today’s fast moving world, where many a times meetings take place on the go, and many employees need to login and access data from their mobiles or tab. Zimbra 8.8 is the perfect solution providing enhanced Mobile Synchronization with all your mobile devices. Zimbra 8.8 incorporates the latest Hierarchical Storage Management system which reduces the current space occupied by your data by 50 %. Improvised easy to Use delegated admin can be created within minutes. Increased reporting functionality and more CLI commands enhances profitability by taking quick actions as per the reports. Cyber Security, Email, Email Archiving, Email Security. permalink.